Superior lodges very well furnished and stylish. Torch/flashlight essential as electricity goes off at 10pm (would have been nice to have known that before we arrived). Food served buffet style and of very good quality. A very enjoyable and relaxing experience in the midst of the jungle. Fairly basic but comfortable - restaurant service very limited although we were taken off site for lunch. Interesting jungle trail at rear of property but some information for residents would have added to experience. OK for a one-night stay - wouldn't want to stay much longer! Clean, comfortable and obviously recently refurbished. Food limited in quality - buffet being the main option. 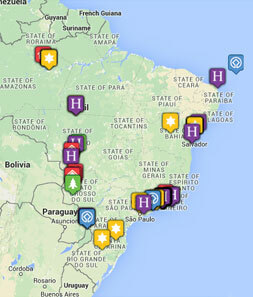 Very close to Brazilian national park (walking distance) but not very close to restaurants.